Live to Play is the events division for Mountain Gear. Over 35 years ago in his living room, Paul Fish designed a better backpack. Then he made it. By hand. Several packs and a few other product modifications later, Paul and his wife Karn opened a small retail shop in Spokane, Washington. The first Mountain Gear location was just a few thousand square feet and served a core group of climbers, backpackers and mountaineers in the inland northwest. 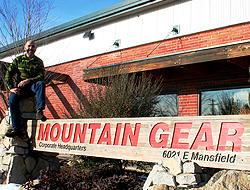 A few years later, Mountain Gear moved into its current retail home at 2002 N Division in Spokane, with an indoor climbing wall and pool. With a passionate, experienced staff teaching classes in climbing, kayaking, backcountry cooking, how to layer clothing, and more, Mountain Gear has helped thousands of people start amazing adventures and life-long hobbies. Mountain Gear’s catalog was first published in 1993 and is now considered an encyclopedic reference of climbing, mountaineering and backpacking gear. The mountaingear.com website launched 2 years later and supports the retail and catalog foundation with a full assortment of clothing and equipment. Mountain Gear’s corporate headquarters and environmentally sustainable distribution center now live in a newly renovated, 112,000-square-foot LEED Gold certified building in Spokane Valley. From humble beginnings, the owners and staff at Mountain Gear are excited to be on the nationwide and international scene as the experts in backcountry adventures. Mountain Gear hosts events and classes that highlight the sports we love. UClimb Learn to Climb takes place through the spring and summer at regional climbing hot spots: Joshua Tree, Red River Gorge and Donner Summit are just a few of the places we hold clinics for beginning-level climbers. Climbers of all skill level can develop their skills at Red Rock Rendezvous – a 3-day event in Las Vegas. For those who like the colder times of year, we offer the Kootenay Coldsmoke Powderfest in Nelson, BC. We also care about supporting charitable causes that help protect and share the outdoors. We’re partners with The Access Fund, as well as with Big City Mountaineers Summit for Someone, a program that gets at-risk urban youth into the outdoors. Overall, you can count on Mountain Gear for the best gear, the most socially conscious practices, and fun events all over the country. Your adventure starts here! We believe that the privilege of enjoying our time outdoors demands that we take actions to protect the environment and the natural places we love. Mountain Gear walks this talk through environmental and wellness initiatives. We are mentors in the Green Building Education Program, and our efforts have been recognized locally and nationally, earning us the Governor’s Award for Pollution Prevention and Sustainable Practices in 2007. Our corporate office and distribution center is LEED Gold certified, and this means our building is not only a healthy place to work, it also has a minimal environmental impact. We’ve got lots of skylights and windows throughout the building, and the carpet, cabinets and counters in our Bistro are all made from recycled materials. Low-flow plumbing, efficient lighting and filtered water make Mountain Gear an industry leader in promoting safe, healthy, low-impact work places. Mountain Gear employees are encouraged to use alternative forms of transportation, a corporate value which is supported through an indoor bike room and shop, and on-site showers at both locations. We also subsidize bus passes, give incentives for carpooling, and offer premier parking for hybrid vehicles. The Mountain Gear community garden is an organic farming effort by the employees, and the bounty is shared by all. Denise, our on-site baker, uses pumpkins, sunflowers and herbs right from our garden in her yummy creations. All of our organic waste is composted, both in a traditional outdoor bin and by using vermiculture (red wiggler worms) – the compost is fed back to the garden. Mountain Gear’s commitment to the environment translates to the products we sell. Our Sustainable Pick program lets you know which products are made from organic, recycled and/or quickly renewable materials, replace a disposable product or are made using Fair Trade practices. Our efforts to provide these products has had an upstream effect – Mountain Gear’s top vendors are considering these guidelines as they design and source new products for the retail market. With 35 years of experience working in Spokane and around the world, we are deeply committed to our community, both the Inland Northwest region and the community of outdoor recreation. We participate in annual projects to clean our rivers, preserve our climbing areas, and ensure that the natural spaces we all love remain accessible to all. We are deeply grateful for your business and invite you to share your thoughts with us about these initiatives.